Martyn Irvine has secured his slot at the London Olympic Games with a strong performance in the track world championships. The Irish rider finished sixth in the concluding kilometre time trial of the multi-round Omnium event, and ended up seventh overall behind the victorious Australian Glenn O�Shea. Irvine, who was earlier fourth in the individual pursuit and then ninth in the scratch race, pushed a large gear around to complete the kilometre in a time of one minute 4.081 seconds. British rider Ed Clancy scorched around the four laps in a superb time of 1 minute 1.948 seconds, setting the best time. O�Shea was second, while Lasse Norman Hansen (Denmark) took third. Previous Omnium leader Zach Bell (Canada) had gone into the time trial on level points to O�Shea, but could only finish eighth. This saw him drop to second overall, while Hansen earned bronze. Despite Hansen finishing four places ahead of him, Irvine�s points total from before the worlds saw him protect Ireland�s seventh place of the European nations in the Olympic rankings. Hansen closed the gap somewhat but not enough to overtake the Irishman. The top eight will have the automatic right to compete in London, ensuring that Irvine will make his Olympic debut. He has been working towards this point for several years, and his qualification is a further success for Irish track cycling after Caroline Ryan�s bronze medal in yesterday�s women�s points race. Three of the six Omnium events were held today. Irvine was fourth in the individual pursuit, ninth in the scratch race and then took that strong sixth in the kilometre time trial. Predictably, he was delighted to achieve his long-running goal of being part of the 2012 Olympic Games. Prior to the start of the championships former US Olympic coach Sparks had underlined Irvine�s ability. �Martyn continues to impress me every day, especially when I look back on where we started this journey almost two years ago,� he told Irishcycling.com. Cycling Ireland CEO Geoff Liffey pointed out that Irvine had completed in eleven out of twelve qualification events since Poland in November 2010, missing Melbourne of that year but doing everything else. It�s been a lot of effort, but that finally paid off today. �Obviously we are delighted. It�s the end of a long road that started two years ago. It�s been difficult as we�ve only had one rider completing in the events�.most of the other countries have used two people. It�s meant that Martyn had to do each one. Irvine competes on the road with the RTS Racing Team, as does David McCann. Liffey said that Irvine would likely do the Tour of Korea with the squad, then come back and ride the An Post R�s with them. At this point, Ireland has secured four slots for the Games. It has three for the road race and time trial, and now Irvine has secured another place. Technically it is berth for the country and not the individual, but Liffey confirmed that Cycling Ireland�s selection process means that Irvine � rightly � will be the rider who will take that place. There is also the chance that two more places could be secured. Depending on what happens between now and the end of May, a women�s road race/time trial place could be secured, and ditto for a BMX slot. Those will depend on the points which can be secured in the next month and a half. There�ll be a lot of work ahead for those trying to secure those places but, as Irvine showed, much is possible if the effort is put in. With one round left to go, Martyn Irvine remains seventh overall in the omnium event following the scratch race at the track world championships in Melbourne. The Irish rider finished ninth in the 15 kilometre, 60 lap race, riding very strongly but being unlucky to miss a key move that went just before the halfway point. Irvine was involved in an attack with approximately 46 laps to go, riding hard with others for several minutes to try to gain a lap on the rest of the field. The bunch brought the move back, then almost immediately the decisive break went. Lasse Norman Hansen (Denmark), Zach Bell (Canada), Shane Archbold (New Zealand), Glenn O�Shea (Australia) and Eloy Teruel Rovira (Spain) worked well together and succeeded in gaining a lap. This ensured that one of them would win, unless another rider succeeded in doing the same. Irvine tried several times, riding very aggressively from that point. He got into several moves but each time these were brought back. The last was close to the end of the race and its recapture left him fatigued for the sprint, but he still managed to finish towards the front and to pick up ninth. Hansen won ahead of Bell and Archbold. The result left Irvine in seventh place, six points off the sixth of Korea�s Ho Sung Cho. Bell leads O�Shea and Hansen in the standings heading into the final event, the kilometre time trial. Irvine�s efforts heading into the worlds ensured that Ireland were seventh of the European teams, with eight to qualify after the championships. The country had 785 points at that point, with Poland on 700 and Denmark on 670. Cycling Ireland�s Geoff Liffey has estimated that providing Irvine finishes within six places of Hansen and Polish rider Rafal Ratajczyk, that he will be safe for London. Heading into the kilometre time trial, the last event, he�s four places behind third-placed Hansen and four ahead of Rajajczyk. The Pole appears out of it now and so it means Irvine needs to keep focused, put in a good final effort and stay close to the Danish rider. Meanwhile Shannon McCurley finished twelfth out of the seventeen starters in the women�s scratch race. She appeared quite far back coming up to the sprint, at which point it became difficult to get past the block of riders ahead. Polish woman Katarzyna Pawlowska won with a superb final burst, outsprinting Melissa Hoskins (Australia) and Kelly Druyts (Belgium). McCurley is based in Australia and is gaining experience for future track campaigns. Martyn Irvine has made a good start to today�s second and final day of the men�s Omnium in the track world championships in Melbourne, finishing fourth out of 23 riders in the individual pursuit. The Irishman started steadily and then finished more quickly to cover the 4000 metre distance in a time of 4 minutes 28.158 seconds. He was just over half a second outside the third place of the Briton Ed Clancy. Danish rider Lasse Norman Hansen was first with 4 minutes 22.33 seconds. Irvine�s performance sees him improve to seventh overall after an overnight placing of tenth. He finished eighth, eighth and fourteenth in yesterday�s flying lap, points race and elimination race, and so has upped his game thus far today. Italian rider Elia Viviani, who had been fourth overnight, did not start today due to injuries from a crash yesterday. Irvine will aim for a strong performance in the final two events today, the scratch race and the one kilometre time trial. He remains on course to qualify for the Olympic Games, and can seal that if he rides well in those final two events. 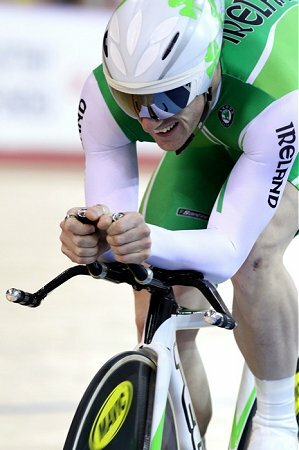 After placing eighth in both the flying lap and the points race, Martyn Irvine was sitting seventh overall in the Omnium event. The third round of the series was the elimination race, which at times in the past has been one which has proved tricky for the Irish rider. Irvine went out sooner than he would have liked, ending up fourteenth. Bryan Coquard (France) won, beating Glenn O'Shea (Australia) and the Polish rider Rafal Ratajczyk. The race was a chaotic affair, with claims afterwards that a number of the rulings on who was eliminated were called out wrong. There were suggestions that the race would either be cancelled or run off again but at the time of writing, there was no sign either of those scenarios would happen. Irvine�s placing there moved him to tenth in the overall standings at this halfway point. The races will continue tomorrow with the individual pursuit, scratch race and kilometre time trial. The Irishman normally rides better on day two and will hope to move back up the standings. He is battling Polish rider Rafal Ratajczyk and the Dane Lasse Norman Hansen to ensure he seals his place in the London Olympic Games. Cycling Ireland�s Geoff Liffey has estimated that if he finishes within five placings of those two, that his place should be safe. Hansen is seventh at present, Irvine tenth and Ratajczyk eleventh. Irvine will be joined by Shannon McCurley in tomorrow�s events. The Australian-based Irishwoman will do the women�s scratch race. After two out of today�s three Omnium events at cycling�s track world championships in Melbourne, Martyn Irvine is sitting a very solid seventh out of 24 starters. The Irish rider was eighth in the opening event, the flying lap, clocking a time of 13.409 seconds. Ed Clancy (Great Britain) was fastest with 12.881 seconds, just over 0.2 quicker than runner up Shane Archbold (New Zealand), points jersey winner in last year�s An Post R�s. Italian rider Elia Viviani, who normally competes in the road with the Liquigas Cannondale team, was best in the points race, gaining a lap and also being placed in eight of the twelve sprints during the race. That left him with a points total of 43, nine better than Spanish runner up Eloy Teruel Rovira. Irvine took two second places and one third in sprints during the race, and was also second in the final gallop to the line. The seven points gained put him eighth in the final total. Clancy leads the overall standings heading into today�s final event, the elimination race. He, Australian Glenn O�Shea and Zach Bell (Canada) have each got eight points. Irvine sits seventh with sixteen points. As the points calculations are based on finishing position, those with the lowest total are best-positioned in the results. Ireland�s Caroline Ryan will also get her track campaign underway today, lining out in the women�s points race later.